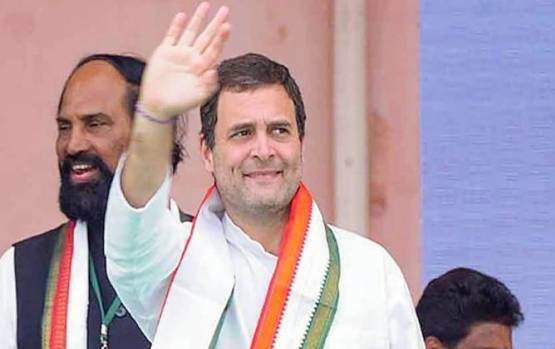 ONI Bureau: As the trends emerged showing a big win for Congress in BJP-ruled Rajasthan and Chhattisgarh and lead in Madhya Pradesh, celebrations have already begun in these states as well as at the national capital today. While addressing press meets in Delhi, Congress President Rahul Gandhi today said that “This is a victory of Congress workers, small traders, farmers”. He further stated that “Congress is going to provide these states a vision, a government that they can be proud of”. “When PM was elected to power, he was elected on three platforms – employment, corruption and farmers. It was in people’s mind that PM would fight against corruption. But, that did not happen. Now people think that PM Modi himself is corrupt after Rafale and other scams,” said Rahul Gandhi. “BJP has an ideology, we’ll fight against it & defeat them. We have defeated them today & we will do this again in 2019. But we don’t want to remove anyone from India. That’s not our goal,” said Rahul Gandhi while taking a dig on BJP’s ‘Congress-mukt Bharat’ slogan.